The Ruined Zoo (荒廃した動物園, Ruined Zoo) is the 7th stage in the Subspace Emissary of Super Smash Bros. Brawl. Lucas is seen depressingly walking through an old and broken-down zoo. Before too long, Shadow Bugs fall from the sky, and form Primids. Lucas gets scared, when suddenly, a giant Porky statue crashes down and chases after Lucas. The Ruined Zoo is a side scrolling area in which Lucas must run away from the Pig King Statue before he knocks him out. The camera scrolls forward (to the right) as the statue walks on. The higher the difficulty, the faster the statue will go. At one point, the statue will fall into the water; however, the statue re-spawns shortly thereafter by falling from the sky. When Lucas reaches the end, he trips and gets caught on a branch. Just when the Pig King Statue almost has him, Ness arrives and destroys the statue, revealing Porky Minch. The two fight and defeat Porky, but Wario appears and attempts to turn Ness into a trophy with his Dark Cannon. However, when Ness proves to be too difficult to hit, Wario sets his sights on Lucas instead. Noticing this, Ness sacrifices himself, pushing Lucas out of the way while he himself turns into a trophy. When Wario leaps from his perch to claim his prize, Lucas runs away in fear. He eventually runs into the Pokémon Trainer, who uses his Squirtle to fight off oncoming Primids. Afterward, Lucas decides to stick with the Pokémon Trainer in order to save Ness and get revenge against Wario. Ninten in front of the Podunk Zoo in Mother. 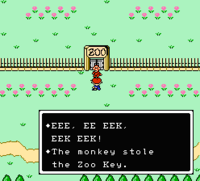 The concept of characters from the Mother/EarthBound series exploring a ruined zoo may be based on the Podunk Zoo thrown into chaos in Mother by the forces of a Starman Jr. until the game's protagonist, Ninten, stops the Starman Jr. and restores order to the zoo. Before Lucas is introduced, a portion of Mother 3 Love Theme can be heard. While running from the Porky Statue and while fighting Porky, Porky's Theme plays. During the first part of the section including Pokémon Trainer, Wild Pokémon Battle! (Diamond/Pearl) plays. During the second part of the section with Pokémon Trainer, Team Galactic Battle! plays. This is the only level in the Subspace Emissary where the player can control a hidden character (in this case, Ness) during the level and not unlock them at the end. This page was last edited on March 28, 2019, at 18:55.